If you're not aware of the Heart's intuitive intelligence, add this to your knowledge today. Please share. I recommend everything HMI does. Be a part of the GCI and join me and many others as we contribute our energies to the Earth's collective field of energy. Boring Cubicle Farm to Soaring Cubicle Charm…Pick a Theme! I do love to play with these grim, gray spaces and turn them into fun, fanciful spaces. 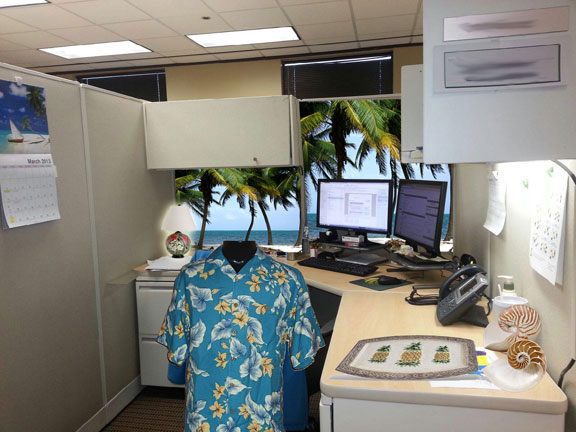 Move your Office to the Islands! 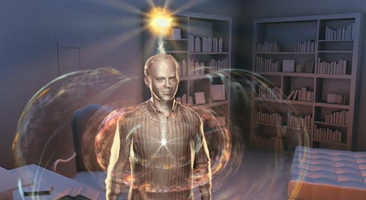 My friend had already made considerable effort to change the vibrational frequencies in her cubicle She has her monitor mirror up to see anyone stepping into the open space at her back. There is a pot of bamboo in her wealth corner. There is a calendar which affirms what I know about her affinity for the beach. She also has a photo of herself at the beach tucked in behind her monitor. I am sending you to the islands every day instead of to the grind. Let's set the stage. Here are photos of what is in my imagination. 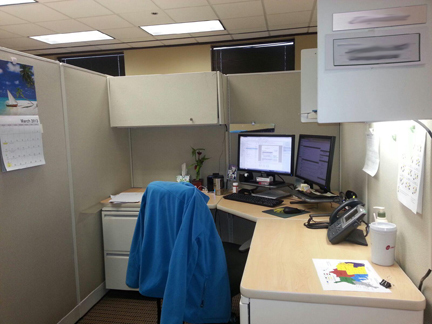 Simple additions will result in big shifts of how this cubicle feels. I've added the Caribbean images here but you can certainly do the Pacific if you prefer that energy. Choose your favorite place and get some of that printed wallpaper. I've even seen posters at Michael's and Hobby Lobby you could cut to fit. 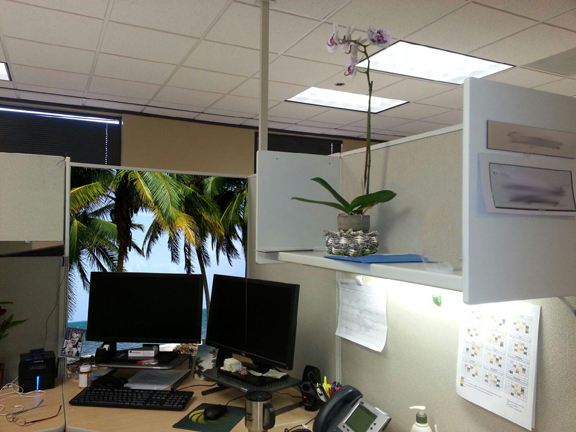 To follow through on the theme, you will see that I've PhotoShopped in a Hawaiian basket under her orchid and removed the Glade air freshener she had beside it (not cute, indicates she feel the space smells bad). She can keep the air freshener, just not out where you can see it as it detracts from the sense of BEing in the islands. I have also moved her monitor mirror to the lower edge of the overhead cabinet, effectively creating the illusion of its disappearance while reflecting incoming activity from behind. In the other photo I've PhotoShopped in a little Hawaiian lamp, a pineapple platter for her papers, keys, pens, or whatever; and a couple of chambered nautilus shells. I encourage her to hang a mobile of tropical fish or one of those fish scale wind chimes from the ceiling above her cubicle's left wing. She should post lots of photos she has taken on trips to to the beach, including her personal visits to Belize, Arruba, Cancun, Cozumel, and Hawaii. She can take this to the next level by posting images of the next trip she intends to take...and cutting herself out of other pictures and placing herself into the new image. She can keep a dish of taste treats from the islands such as macadamia nuts or pineapple candies, whichever appeals most to her. She could keep some of those tiny umbrellas for her water glass, add a ring of orange or lemon or a wedge of pineapple, and stay in the mood all the time. IF she worked in Honolulu, she'd have a lei or two draped somewhere, and maybe a carved statue - perhaps a hula dancer(? ), and perhaps a fan made of palms. She might have a coconut shell pencil holder? She can just as easily switch this to Cuban beach or the Bahamas, depending on her choice of accessories. I encourage you to have fun staging the scene. I would bring sunscreen to the office and use it like lotion just to get the scent into the mindset. :) Hit every sensory input button you can. Think steel drum music or perhaps ukelele music - again whichever matches your personal magic. Here's the thing to remember: Every time you step into your space, you want to step into another reality. Put Jimmy Buffet or some reggae on your computer, or play the sound of the sea all day softly so it doesn't bother others. The background images of the palms and water posted on the background fabric are of primary importance. They will have the biggest impact. Your co-workers will FLIP and you will love it every day! So you have a new home... Congratulations!! Blessing your house changes it from a structure to a home, giving it life via your appreciation, love and respect. 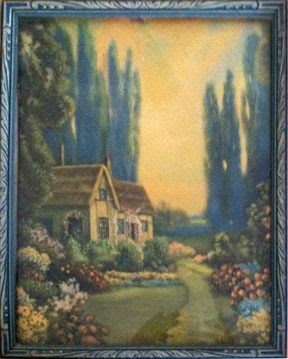 Here is a simply way to place your vibrational frequencies to harmony in a new home. First, clean it top to bottom, inside and out. The windows should sparkle. All plumbing fixtures should be pristine. Floors should glisten. The place should look, smell, and feel fresh. Bow to the house. Then take a fresh box of Kosher or sea salt. Sprinkle a line of salt across the driveway entrance(s) and all exterior doors (including garage doors). Then, starting just inside the front door with the door closed, call in the four archangels. Ask Uriel, Raphael, Gabriel, and Michael to guide and protect you always. Then, moving always clockwise, place a pinch of salt in each corner of every room (and in front of any poison arrows you come across as you go), until you have done this in all corners in all rooms on all floors and returned to the front door where you redraw an inside line of salt. Then go put a heavy pinch of salt down every drain, including toilets, sinks, showers, bathtubs, washer drains, and dishwasher bottoms. Light a candle and put on some awesome music. 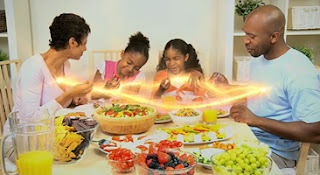 Break bread (eat something tasty) and drink a glass of your favorite beverage, saying in your blessing of the food that there will always be bountiful food and celebration in the house. Thank God and the angels for your feast, your celebration, and your wonderful new home.